After spending several years photographing weddings in Charlotte, I decided it was time to make my focus something I truely loved NEWBORNS! Is there anything more amazing then those tiny toes, and squishy faces? I have spent almost a decade working in photography, and over 8 years as a mother so I am comfortable with handling those precious bundles and passionate about my work. I am constantly expanding my knowledge base by taking workshops, webinars, tutorials, and safety classes. I also am obsessed with props so I am always shopping for new items to use in my Newborn sessions to make them unique to each family. My husband is originally from the St. Louis area (near Jerseyville and Carrollton, Illinois) and has wanted to move back to the area for many years. We are at that point in our lives and are so excited to be making the move to St. Louis this summer. I will be accepting Newborn sessions for August due dates now and can't wait to get some Blues and Cardinals themed newborn props! 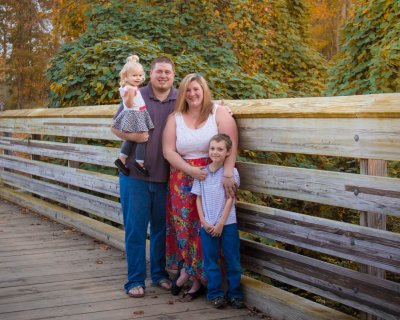 I look forward to getting to know your family and capturing some sweet moments for you. Please contact me if you have any questions or would like me to send you an information packet about a newborn photography session. Be sure to LIKE my Facebook to get up to date looks as new sessions happen all the time and I don't update my site as often as my facebook page.